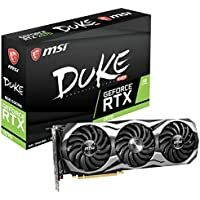 Get MSI GeForce RTX 2070 DUKE 8G OC 8 GB GDDR6 256-bit 1410 MHz Graphics Card + NVIDIA Gift for only $473.99. Tip: Avoid low or no feedback sellers, search and select "Buy It Now" tab and sort by lowest price. You may modify min price to filter accessories to get MSI GeForce auctions.